The first modern war created the modern Nation. 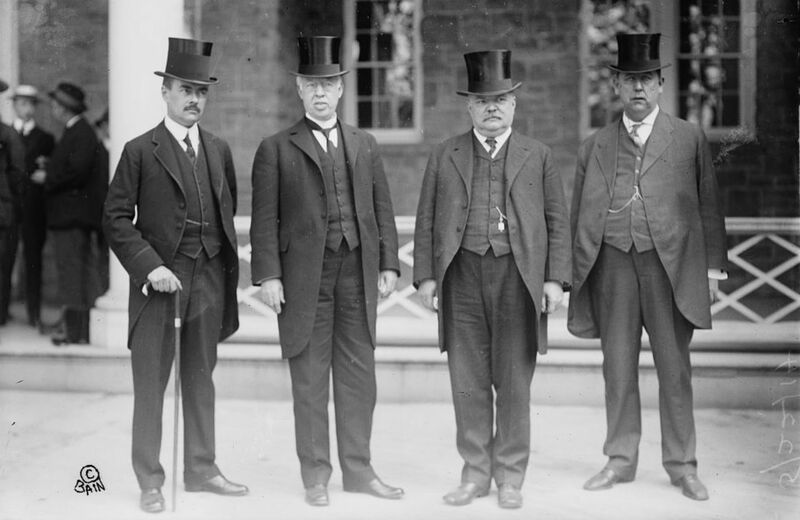 US delegates to the Niagara Peace Conference of 1914: Associate Justice Lamar of the US Supreme Court, former Solicitor General Frederick W. Lehman and Robert F. Rose, foreign trade adviser with the US State Department (source: Creative Commons project, 2011) Forms part of: George Grantham Bain Collection (Library of Congress). “Pressure from the southern Slavs is bound to increase,” the essayist Simeon Strunsky casually observed in an essay on the Austro-Hungarian empire, published in the June 4, 1914, issue of The Nation. It was an understatement, to say the least. On June 28, 1914, Archduke Franz Ferdinand, heir to the Hapsburg throne, and his wife, Sophie, were shot and killed when their car—in which they had just survived an assassination attempt by grenade—made a wrong turn down Franz Josef Street in Sarajevo and happened to run into an armed Gavrilo Princip. By early August, most of Europe was at war and the world was changed forever. The first modern war, then, created the modern Nation. Today we inaugurate here at Back Issues what will become a recurring feature of the blog: “Great War” will follow—in real time, one hundred years later—the political and military maneuvering both before the outbreak of fighting and once the war got under way. We will pay special attention, as The Nation did at the time, to the developing debate in the United States about whether and how to involve itself for the first time in a great European war and also to how the magazine’s position changed—or did not—as the international and domestic situation changed. It will offer, we hope, a unique approach to the experience of history—a curated “real-time” introduction to the war for those who don’t know much about it and a fresh perspective for those who do. What is most shocking about reading through the pages of The Nation from June 1914, before the world went to pieces, is the alarming ignorance of the apocalyptic conflict just over the horizon. Though the magazine had closely watched the table-setting Balkan Wars of 1912 and 1913, there was little except for Strunsky’s nine words that might have augured any serious unpleasantness to come. The issue published June 25, 1914, the last before the assassination, is especially poignant in its ignorance of the events about to unfold. The lead editorial notes are devoted, as they had been for weeks, to developments in Niagara Falls, Canada, where a peace conference had convened to sort out issues between the US and Mexican governments. In April, amid the turmoil of the Mexican Revolution, the United States had seized the port at Veracruz to protect the lives and property of Americans involved in the nascent oil industry. The dramatic series of events would later feature in John Dos Passos’s The 42nd Parallel. The parties came to an agreement and war—that war at least—was avoided. It will all come out right. The troubles are not political, but social. Human history and experience teach that things go around in circles. We are now in a part of the circle which I shall not endeavor to classify. We are troubled with an epidemic of emotion among people who don’t stop to reflect. Radical doctrines are merely a sign of the times. Some day there will be a further swing around the circle and then you will see a change. 1789 did not introduce a permanent regime of sans-culottes, guillotines, Jacobin clubs, and a calendar in which Year One was the date of the French Convention. The settling down of affairs after 1848 did not establish a world-wide institution of State Socialism. Neither will the aftermath of the present furious emotion upheaval leave the courts or the marriage ceremony abolished, or the banks and the stock exchanges managed by legislative committees. Mr. Edmunds was wise, however, in declining to commit himself as to exactly what part of the circle we are in to-day. That is something which every one would like to know, and which it is not at all probable any one will know until we are considerably further along on the periphery.